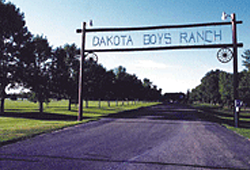 Victor and Dorothy Young first visited the Ranch in the early 1950s while traveling through Minot on business. They were quite impressed by what they saw, especially the Ranch's faith-centered approach. Over the years, Victor and Dorothy supported the Ranch, sometimes offering items to the Ranch garage sales to help raise funds. Other times, donating inventory from their successful wholesale grocer business. use in day-to-day operations. They also told us of their intention to remember the Ranch in their Will. When Dorothy died, the Ranch received a generous bequest, and Victor told the Ranch more would be coming at the time of his death. A year later, we received a call from Victor and Dorothy's son, Andy. His father had died and he wanted us to know that a significant gift would be forthcoming from his father's estate. Andy said, "My parents have been life supporters of the Ranch since its earliest years. It is their favorite ministry." Andy continues the family tradition of stewardship by supporting the Ranch.